In conversations about the declining homeownership rate in the U.S., some commentators have pointed to declines in the share of married people as an important contributing factor. To be sure, married couples are much more likely to be homeowners than unmarried individuals, due to their generally better socio-economic status. Married couples are also more likely to have children, and therefore more likely to want larger homes in areas with more family-friendly amenities such as safe neighborhoods and good schools. And these features are more often found in suburban neighborhoods where a larger percentage of the housing stock is available to own rather than rent. 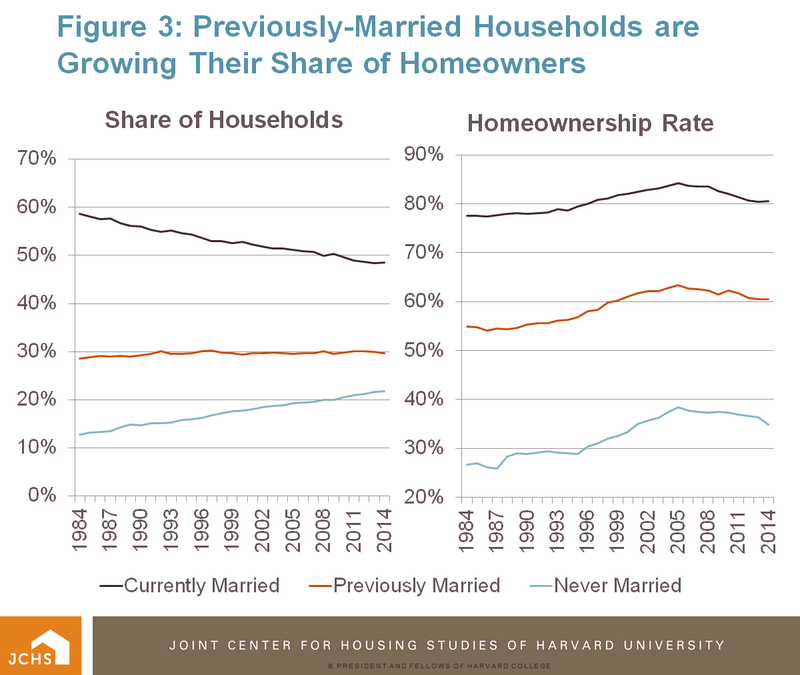 A decrease in married couples, goes the argument, should reduce the share of households that own their homes. While this is true, all else equal, this rationale fails to consider three important facts about marriage and homeownership that suggest this effect is not as large as many people imagine, and that recent trends are not necessarily indicative of a fundamental shift in demand for owned homes. Fact #1: Marriage rates have been declining for decades. 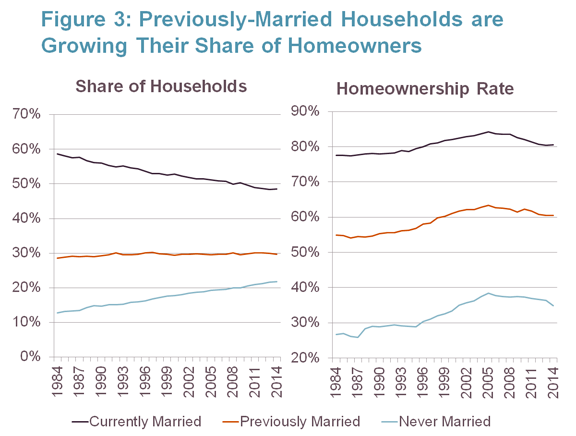 While concern over the connection between declining marriage rates and declining homeownership has gained traction in recent years, the share of households headed by a married couple has actually been on a steady downward trend since the 1960s when over 70 percent of adults ages 18 and older were married (Figure 1). Declines since 1960 in the married share have been dramatic, falling fully 17 percentage points from a half-century earlier. The time frame of this decline, however, coincides with a period of steady increases in the national homeownership rate, from 62 percent in 1960 to 66 percent in 2000. 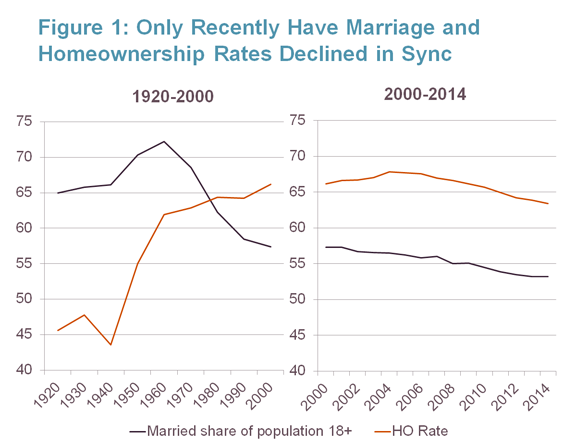 Indeed, only during a brief period in the early 1980s did the homeownership rate decline slightly, at the same time that marriage rates were falling (though moderating somewhat from more dramatic decreases during the 1970s). Since the turn of the century, of course, the homeownership rate has declined from a peak of 68 percent in 2004 to 64 percent earlier this year. In that time, the married share of the population has also fallen slightly, thus fueling the argument that the two trends are linked. Yet these recent declines in homeownership and marriage rates have also been greatly impacted by conditions in the macro economy, particularly the slow pace of earnings growth and high unemployment. The decline in marriage rates is also clearly a continuation of a long-term trend related to socio-demographic changes in the population and shifting social norms around relationships and cohabitation. The fall-off in homeownership, meanwhile, is largely viewed as a reversion to conditions that existed prior to the late 1990s and early 2000s spike in home buying, rather than purely a reflection of changing household compositions. This is not to say that there is no connection between marriage and homeownership, only that there is more to this story. 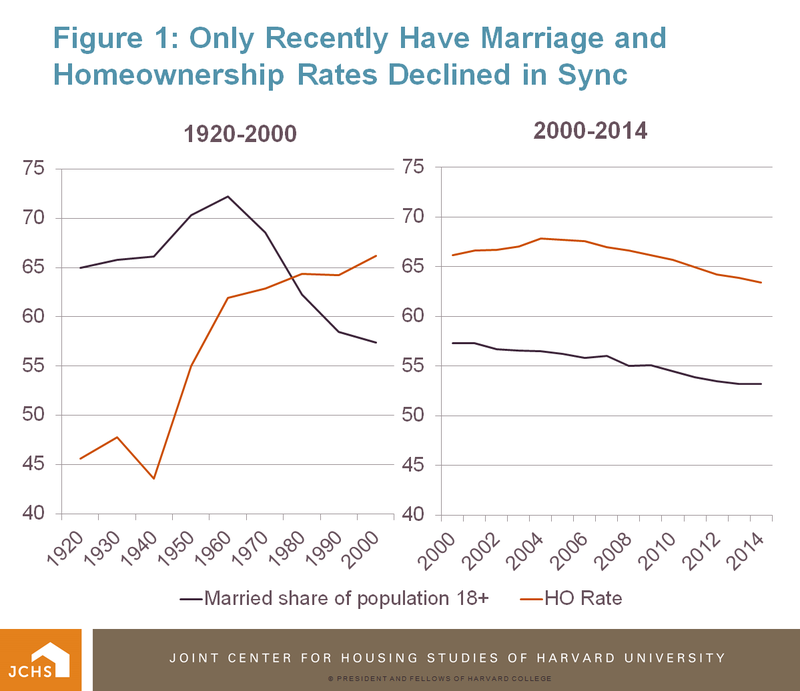 As the statisticians say, correlation is not causation, so looking at recent changes in marriage and homeownership does not necessarily mean that one fully explains the other. Note: The homeownership rate from 2000-2014 is calculated by using the Decennial Census rate from 2000 and adjusting annually by the change in the homeownership rate reported by the Housing Vacancy Survey. Sources: U.S. Census Bureau’s Decennial Census and Housing Vacancy Surveys. 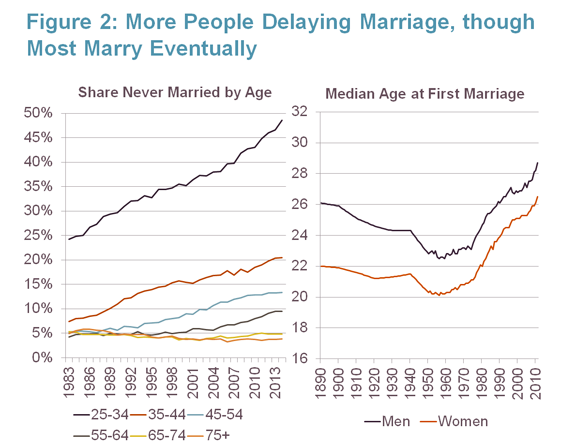 Fact #2: People are still marrying, just later. The share of married adults in the U.S. only tells part of the story about the marital status of Americans. A better indicator may be the share that have ever been married, observed in mid-life when most people are settled and those who will marry have likely done so. By their late 40s, more than 85 percent of Americans report having been ever married, with that share leveling off over the last decade (Figure 2). Even by their late 30s, nearly 80 percent of people have tied the knot. The big change over the last 30 years, however, has been in the share of young adults aged 25-34 who have not married, which rose from 25 percent in the mid-1980s to almost 50 percent today, with notable acceleration over the last 10 years. The driving force behind this trend has been a steady increase in the age at first marriage, from 20 years old for women and 22.5 for men in the late 1950s, to 26.5 and 29 years old, respectively, in 2011. Young adults are more likely today to pursue post-secondary education, to relocate to a new area for employment, and to live with partners before marrying, all of which combines to delay the trip down the aisle. Again, these trends are not new, but have been gaining momentum for the past half-century. Source: U.S. Census Bureau’s Decennial Census and Current Population Surveys. It is worth noting that most young adults today still expect to marry eventually. The Pew Research Center reports that 66 percent of never-married adults under age 30 say they would like to get married someday. And even higher shares of young adults say they want to own a home; recent research published by the Joint Center shows that 88 percent of renters ages 25-34 plan to buy a home, and that their intentions are not influenced by their current marital status. It appears that, like marriage, many of these young adults are not rejecting homeownership, but rather delaying their purchase until they are more personally and financially settled. Fact #3: It’s not only the current marriages that drive homeownership. This last point about marriage and homeownership is one that does not get a lot of attention, but is very important to conversations about homeownership rates going forward. Among the unmarried population in the U.S. are a large number of previously married adults – those who are divorced or whose spouse has died – who have very different homeownership experiences from those who have never been married. Indeed, even as married households have been on the decline in the U.S., the share of householders who report being previously-but-not-currently married has remained steady at around 30 percent (Figure 3). The effect of these prior marriages on homeownership is profound, as previously-married householders are much more likely to own than never-married householders. Many of these are ‘legacy’ homeowners who bought while still married and remained in the home after becoming single, although some likely bought homes without a spouse, using proceeds from a home they owned when married. Previously-married householders have also seen a smaller decline in their homeownership rate, relative to currently-married householders, since the end of the housing boom a decade ago. All of these groups, moreover, have homeownership rates today that are at or above their pre-boom levels from the mid-1990s, suggesting that homeownership has been an important and popular choice for all households regardless of their marital status. Note: Data are share of householders, not persons, by marital and tenure status. Households who report being separated from their spouse are not considered to be currently married. Source: U.S. Census Bureau’s Current Population Surveys. These facts make clear that recent concerns about the decline in marriage leading to less demand for homeownership are perhaps overstated. While married couples continue to own homes at higher rates than unmarried individuals, there is more to this relationship. Only recently have shares of married couples and shares of home-owning households both been declining, due mostly to economic factors, while vast majorities of the population still aspire to both marriage and homeownership. Nor are married couples the only ones owning homes, as both previously-married and never-married householders significantly increased their homeownership rates during the housing boom, with only small declines since the peak in 2005. 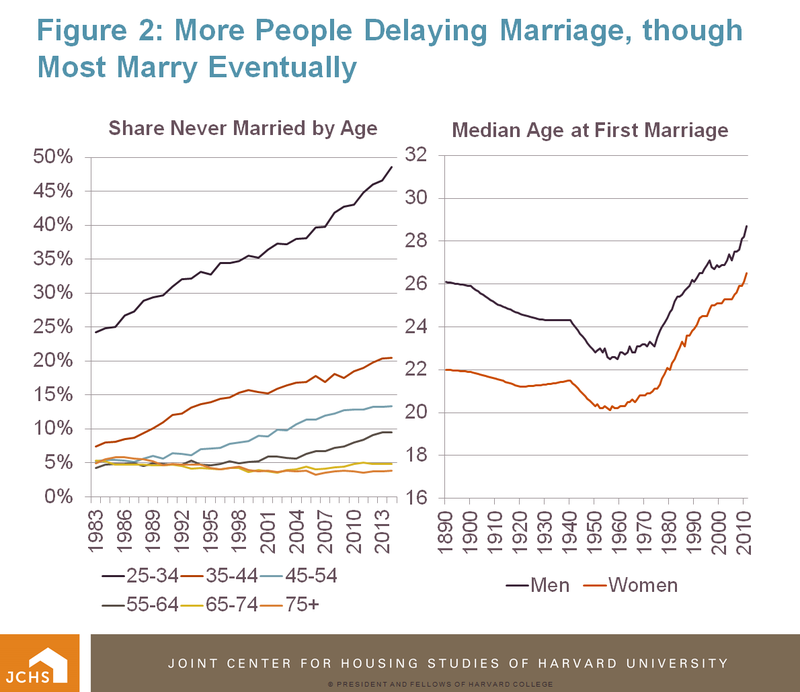 Finally, it is worth noting that most discussions of the role of marriage in housing decisions fail to consider the importance of other changes in household demographics that have had an impact on homeownership rate; the increasing share of minorities in the population, for example, can have a lowering effect on homeownership rates, while higher rates of college educated adults in the population should increase the share that own. The most important factors in recent declines in homeownership rates, however, are the performances of the housing market and economy, which determine whether households of all types are able to purchase homes. Stagnant incomes and constrained credit have had greater impacts on homeownership rates since the end of the housing boom than long-term demographic changes, and will likely continue to drive homeownership trends in the near future.